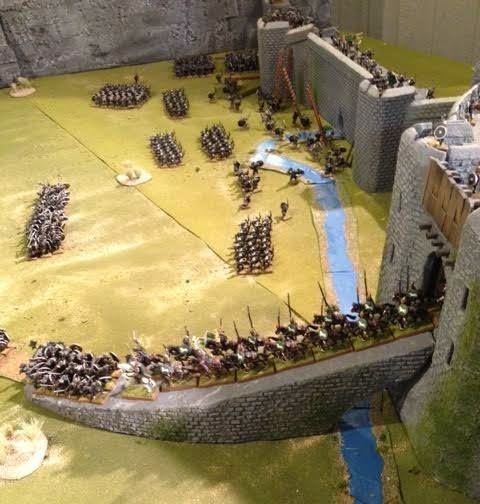 Here is my Battle of Helms Deep game I am about to start playing this weekend….ssssssssssss. Another Lord of the Rings campaign…next is Osgilith. I'm speechless… that is fantastic! Tom, fantastic scale. Massed armies and excellent terrain are a visual feast. Do you have a gaming group or do you play most of your games solo? Now that is a wargame! Ambitious, colorful, atmospheric and nicely detailed!…. Wow. A stupendous looking epic siege game. Thanks for posting! What a magnificent fortress -- is it your own custom-built job? Amazing look to the game, and excellent work on the terrain. Thanks to all. I mostly game solo, except on Friday nights with my wife and we game on another table. This is the Epic table. The Helms Deep was made by the Castle Works Company, but I warn you, see the consumer affairs page on this company, long story. I am lucky I got this lovely built Helms Deep. I painted all the minis, most are the old Harlequin LOTR minis, along with a few Mithril minis, and a few Thunderbolt Mountain minis. I put together a Scenario using the GW LOTR rule book, so its a scenario game. There will be 3 battles going on. And I use Mass combat rules, home made rules, since I play solo. But I pull from various rule books all over. I have like a storage of rules in my head to use. Erkenbrand is in the cavalry charge, not Eomer, Eomer is at the breach in this game. The only thing different from the book is the Cavarly charge and from the opposite direction (as far as positions of troops). Nicely done wargaming terrain and setup! Please do post pictures of your Osgiliath table. Are the mounted Rohan troops from Harlequin? Well in case they are Grendel have got them -pretty sure these are the old Harliquins. I use Foundry Arthurians myself. Hello, yes the Rohan cav is the old Harlequin LOTR and Grendel I do believe have the molds. They do not have them posted, but I emailed them up and asked about some of the half orcs, if they had the molds and they did and they poured some for me, I am sure emailing them wouldnt hurt. I had good luck. That how I increased my orcs by 500 in the last few months. Cost me about $800 USD, but worth it once painted. I am a big LOTR Harlequin fan. They are still in production. I think they said a long time ago, (Grendel) that they were re working the molds. Actually they do have some of the Rohan foot up on their website. Correction, they do have the rohan cavalry posted up, along with the half orcs, great orcs, dwarves, southrons, and barbarians, etc. A few months ago, they only had a small amount posted on their website. These are by far some of the best minis out there, IMO. Obviously i have a few thousand of them. Well done. I'm very impressed.